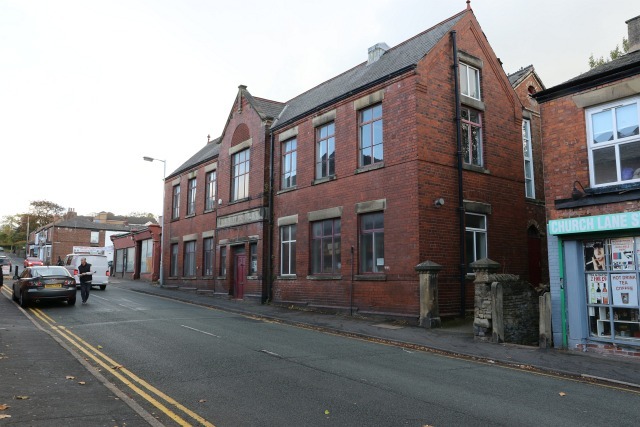 In November 2018 Marple Area Committee recommended the refusal of a planning application to demolish the old Albert Schools buildings on Church Lane in order to build new apartments and retail premises. The matter then went to the council's Highways and Planning Committee for a final decision. At this meeting councillors representing other areas of Stockport disregarded the Marple Committee's recommendation and approved the application. Local residents were very disappointed and a petition was started against this. Lots of people also vented their anger on social media at the impending loss of the building, but to no avail. Unfortunately the building is not listed - Marple Civic Society did nominate the building for local listing some time ago but Albert Schools was the only heritage nomination refused by SMBC for local listing. Over a hundred other heritage buildings were locally listed, giving them extra protection under planning law. So the community has to get used to the idea of this historic building being demolished. It is probably going to happen pretty soon as E & E Workwear, the company that has used the building for their business since the late 1950s, will close their doors for the last time in March 2019. With just a few weeks to go before E & E Workwear was due to close, local man Nigel Millard happened to vist with his daughter to buy some overalls. After a casual enquiry about any memorabilia being available Nigel was concerned to learn that there was a broken WWI memorial plaque in a cupboard under the stairs that had been there for as long as anyone could remember. Even staff who have worked there for 20 years or more had no idea how long it had been under the stairs or how it got there. Nigel tried getting in touch with the National Memorial Arboretum but they said they couldn't help. Recognising that most of the names on the plaque were on the timeline in Memorial Park, his partner Stephanie Shaw got in touch with me to ask if I could help to save it. Of course saving local artifacts is something the Marple Website has gained a reputation for over the years and I was delighted to make a quick visit to take a peek under the stairs at Albert Schools. The owners of E & E Workwear confirmed that they were happy for the memorial plaque to be taken into care and I arranged to pick it up with my son a couple of days later. Much to our surprise, when we removed the largest section of the memorial from under the stairs, we discovered that there was another marble plaque beneath it, this one in memory of Thomas Carver and his wife Hannah. We can only speculate when and why the plaques were literally thown into the understairs cupboard. It could be that it was done when E & E Workwear first took over the premises. Maybe until then they were hanging in the school building and were in the way of progress as far as its new use was concerned. Another theory developing is that they may have originally been in the Union Rooms Mission Church and were removed when it became a cinema in 1931 - the same year that the school closed. Wherever they came from, it seems a heartless act to chuck them in an understair cupboard but at least they weren't thrown away and remained there waiting to be rescued all these years later. The first task after removing the two plaques was to trial-fit the broken peices back together and give them a bit of a clean-up. This was done with just soapy water, a sponge and a soft brush to ensure no damage was done. A toothbrush was used to clean the carved section showing 1914 - 1918. In the longer term the cost and merits of a professional restoration will be investigated. The next step will be to investigate the best place to put these plaques on public display. There are a number of initial ideas that can be pursued and lots of people to talk to. Marple Local History Society have already been contacted and they will be giving this some thought too and will also see if they can find out any extra information about the history of these items. Apart from Marmaduke Cooper, all seven of the other men are named on the War Memorial in the park and their cards are featured on the timeline. There are several links between the seven, they all lived very close to the Hollins Mill, at least four of them and possibly more worked at the mill before they enlisted, and they are almost certainly all linked to the United Reformed Church on Hibbert Lane and the Sunday School that was in the Albert Schools building. Marmaduke's link to Marple and the Albert Schools is less clear. He died on 25 March 1918 and the Commonwealth War Graves web site records him as being the son of Joseph and Elizabeth Cooper, of 17, Boston St., Hyde, Cheshire; and husband of Lizzie Cooper, of 5, King St., Hollingworth, Manchester. Research by Marple Local History Society using census records shows that in 1911 Marmaduke and Lizzie were living in Macclesfield but their daughter Olive, then aged 2, was born in Marple. Their elder daughter Doris, aged 4, was recorded as being born in Hollingworth. So the couple must have lived here for a period between about 1905 and 1911 and presumably attended the church on Hibbert Lane and / or the Sunday School. Marmaduke worked as an “assistant superintendent - insurance” before enlisting, so he would have collected premiums door to door. As most people will know, the Carver family owned and ran the Hollins Mill, which was located where the Asda store is today. They had a huge influence on the area and left a significant legacy of buildings and institutions, including the Union Rooms (now the Regent Cinema) the Carver Theatre, the Albert Schools, the Congregational Church on Hibbert Lane (now the United Reformed Church), Marple Bands and of course Hollins House and Marple Memorial Park. The photos above of Thomas - presented to Mr Carver on 16th August 1901 by members of their Church and Congregation to commemorate his 70th birthday - and of Hannah - presented to Mrs Carver on 5th December 1903 by members of their Church and Congregation to commemorate 25 years of the Union Rooms - are now in the Carver Theatre. There is a display panel at the entrance to the park created by Friends of Memorial Park and this gives a summary of the family's history: Read more about the display here. Thomas Carver and his twin John first came to Marple in 1859 when they purchased Hollins Mill from the family of Charles Walmsley. Thomas moved his family into Hollins House using the canal arm that ran into the mill yard to transport their possessions. The sunken bridge parapet at the park entrance is one of the last traces of the arm, which was filled in during the late 1950s. John built a new home for his family called Woodville Hall. This was later purchased by Frank Barlow, who married Thomas’s eldest daughter Mary, and it became home to the Barlow family. The Carvers were Congregationalists and raised money to build a new chapel on Hibbert Lane that was opened in 1865 (now the United Reformed Church). In 1868 they established the Albert School on Church Lane. Good attendance apparently ensured half-time employment at Hollins Mill! During the cotton famine of the early 1860s Thomas’s wife Hannah ran a soup kitchen for the people of Marple and became very involved in the lives of the mill workers and their families. This led to her setting up the Sick Nursing Society. Thomas made an impact on Marple in many ways. He tried to improve the ‘lot’ of his workers by organising lectures after work and providing a library. He formed the Hollins Mill Brass Band and often played drums with them. In 1878 Thomas built the Union Rooms, now the cinema just a short distance from the park. This included a coffee tavern, a library and reading rooms and a room for religious services. ‘Free and Easy’ evenings were a regular feature and the Carver family often provided musical entertainment. In 1882 Thomas formed the Union Room Mission Army, which had its own band until 1899 when it apparently blotted its copybook by visiting a local hostelry and some members had to be taken home in wheelbarrows! Frank Barlow had business interests in tea plantations in Ceylon. He also became involved in the life of the village and was president of Marple Band when it was formed in 1900. Around the same time Thomas and his son Oswald purchased Springfield House on Church Lane and installed a gymnasium so that the young men in the area could exercise. It is better known today as the Carver Theatre. 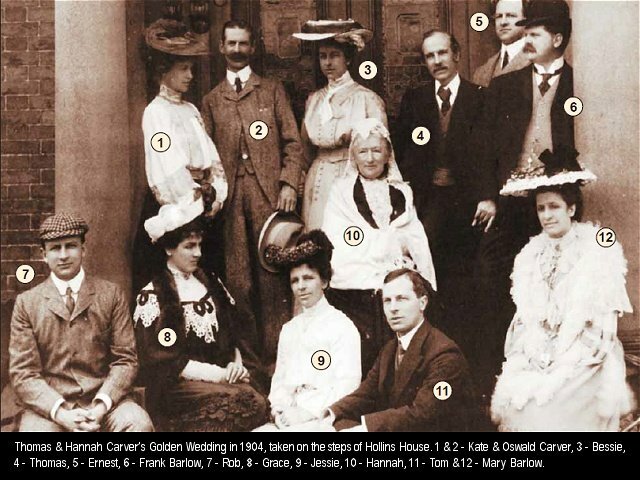 Thomas and Hannah celebrated their Golden Wedding Anniversary in 1904 and they are pictured below on the steps of Hollins House with their family. Soon after the couple moved to Southport. Hannah died in 1908 and Thomas passed away three years later. The First World War took the lives of four of the Carver grandchildren. Two sons of Oswald and Kate and one son of Ernest. Frank and Mary Barlow also lost their only son. A dreadful toll for one family and perhaps just as well that Thomas and Hannah did not live long enough to grieve their loss. 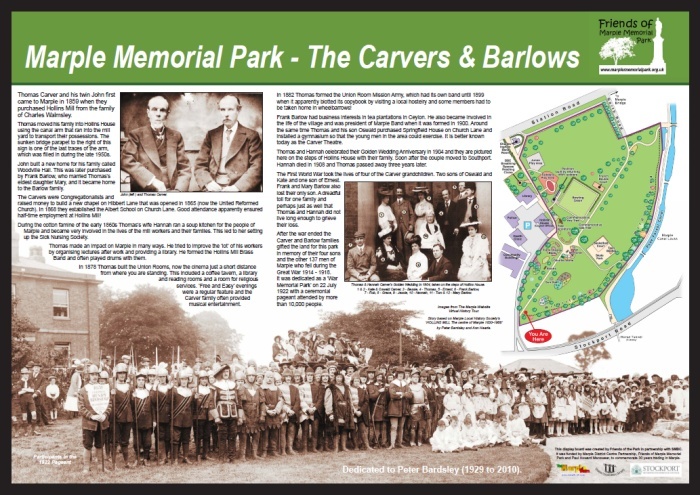 After the war ended the Carver and Barlow families gifted the land for this park in memory of their four sons and the other 137 men of Marple who fell during the Great War 1914 - 1918. It was dedicated as a ‘War Memorial Park’ on 22 July 1922 with a ceremonial pageant attended by more than 10,000 people. You can read a detailed history of the Albert Schools on Marple Local History Society's web site. There are photos of children and teachers at the school on the Marple Website's Virtual History Tour. Thank you to Nigel Millard and Stephanie Shaw for bringing the War Memorial plaque to my attention, to Amos Lowe and the owners of E& E Workwear for their cooperation and to Mike Whittaker for helping out with transport and lifting of the plaques. Mark Whittaker - the Marple Website.